Zane Gonzalez has found a new gig. The Cardinals announced that they’ve signed the free agent kicker to their practice squad. The 2017 seventh-round pick out of Arizona State hasn’t had the strongest start to his career. He appeared in 16 games as a rookie with the Browns, connecting on 15 of his 20 field goal attempts and 25 of his 26 extra point tries. The 23-year-old struggled in his two games this season, and the Browns released him following a dreadful Week 2 where he missed a pair of field goals and two extra points. Later reports indicated that the kicker was dealing with a slightly torn groin, and Gonzalez ended up earning a $35K injury settlement from Cleveland. The injury had a recovery timeline of three weeks, so Gonzalez is presumably good to go. Of course, he’ll have a tough time cracking the Cardinals roster. With Phil Dawson expected to return from injury this week, the team moved on from Matt McCrane yesterday. The 43-year-old Dawson hasn’t done anything to lose his job this season, but Arizona could be eyeing Gonzalez for 2019 should the veteran decided to hang up his cleats. 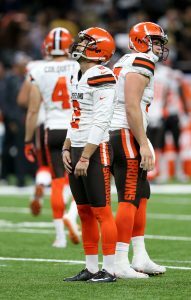 Former Browns kicker Zane Gonzalez is nearing a return to health and should take part in auditions before the end of October, reports Adam Schefter of ESPN.com. Gonzalez was waived following a dreadful Week 2 performance in which he missed two field goals, including a 53-yarder that would have sent the game to overtime, and two extra points, including one that would have given the Browns a one-point lead with less than 90 seconds remaining. Cleveland, of course, was searching for its first victory since the 2016 season. A seventh-round pick in 2017, Gonzalez converted 75% of his field goal attempts and 25-of-26 of his extra points during his rookie campaign. Subsequent reports indicated Gonzalez was dealing with a slightly torn groin, so the Browns waived him with an injury designation. That injury had a recovery timeline of three weeks, and after meeting with a physician to confirm the diagnosis, Gonzalez received a $35K injury settlement from Cleveland, per Schefter. Gonzalez reportedly suffered the injury during pregame warmups in Week 2, but failed to alert the Browns’ coaching staff until halftime. As expected after the Browns’ signing of rookie kicker Greg Joseph, Zane Gonzalez will no longer be on the roster. The Browns are waiving the second-year kicker, Mary Kay Cabot of cleveland.com reports (on Twitter). Gonzalez endured a brutal afternoon in a narrow Browns loss to the Saints on Sunday and will head to the waiver wire, or potentially the Browns’ IR. This transaction could involve an injury designation. Gonzalez has been kicking with a groin injury that required a Monday MRI. It’s not clear if an injury waiver will be required, which would send Gonzalez to Cleveland’s IR if he went unclaimed, but that’s possible. Joseph will take over kicking duties in Cleveland in advance of the Browns’ Thursday-night game against the Jets. Gonzalez missed two field goals and an extra point in New Orleans and had his game-winning field goal attempt blocked in the rain against the Steelers in Week 1. He’s played a big role in why the Browns are 0-1-1 and not 2-0 to start the 2018 slate. Zane Gonzalez‘s rough day in New Orleans has prompted the Browns to sign another kicker. They’re bringing rookie UDFA Greg Joseph aboard, Ian Rapoport of NFL.com tweets. Joseph worked out for Cleveland prior to Week 1 and then again on Monday morning. The Florida Atlantic product landed with the Dolphins shortly after the draft but could not make their 53-man roster. Indications coming out of Cleveland earlier today pointed to Gonzalez being replaced. The Browns also worked out Cairo Santos and Blair Walsh but will go with a far less experienced player. Gonzalez missed two field goals and two extra points in a three-point loss to the Saints. The Browns remain in search of their first win since Christmas Eve 2016 but have seen kicking woes potentially stop them from being 2-0 to start 2018. Gonzalez, though, has been battling a groin injury, Adam Schefter of ESPN.com reports (on Twitter), helping to explain his recent trouble. Gonzalez will undergo an MRI Monday. This could lead to the Browns waiving him with an injury designation. Joseph was Florida Atlantic’s kicker from 2014-17. He made 71.4 percent of his field goals in each of his final two Owls seasons and connected on 64 of 68 extra points as a senior. The Browns chose Gonzalez in the seventh round out of Arizona State last year, and if he’s off the roster soon, this will mean yet another previous regime’s investment is out of the picture. John Dorsey‘s continued to go in that direction since taking over in Cleveland. Gonzalez made 15 of 20 field goals and 25 of 26 PATs as a rookie but struggled immensely against the Saints, essentially negating any progress he’d made in Year 1. 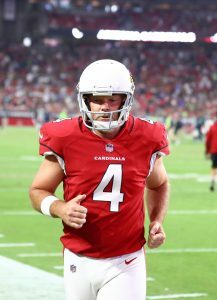 Zane Gonzalez had a performance to forget against the Saints on Sunday, so the Browns are now auditioning free agent kickers Blair Walsh and Cairo Santos, according to Mike Garafolo of NFL.com (Twitter link). Adam Schefter of ESPN.com (Twitter link) was the first to report Cleveland was expected to change kickers. Gonzalez was dreadful in Week 2, as he missed two field goals, including a 53-yarder that would have sent the game to overtime, and two extra points, including one that would have given the Browns a one-point lead with less than 90 seconds remaining. Cleveland, of course, was searching for its first victory since the 2016 season. A seventh-round pick in 2017, Gonzalez converted 75% of his field goal attempts and 25-of-26 of his extra points during his rookie campaign. Both Walsh and Santos come with their own problems. Walsh has dealt with accuracy issues throughout his career, and was cut by the Seahawks after hitting only 72.4% of his field goals in 2017. Santos has historically been the better kicker, but he’s dealt with a nagging groin injury for more than a year. One name who has yet to be linked to the Browns is veteran Dan Bailey, who was released by the Cowboys at final cutdowns. Per Darren Wolfson of KSTP (Twitter link), Bailey has recently turned down offers from four clubs as he waits for the “right opportunity,” one that may include suiting up for a contender.